In 2016 Doorbraak activist Jennifer van Leijen initiated a campaign to stop the Dutch government from subsidizing blackface (Zwarte Piet or Black Pete) on children’s television. More than 16.000 people already signed. Van Leijen regularly writes updates. Here is number 21 (also read numbers 1, 2, 3, 4, 5, 6/7, 8, 9, 10, 11, 12, 13, 14, 15, 16, 17, 18, 19 and 20). Yesterday I witnessed what I believe one day will be seen as an important day in the Netherlands regarding the fight to get Dutch state recognition that Zwarte Piet, the blackface caricature, is both racist, discriminatory and should be eliminated. The Majority Perspective foundation brought emergency interlocutory proceedings in a civil action at the court in Haarlem requesting that there be no blackface during the national Sinterklaas welcome parade which is due to take place next Saturday in the Zaanse Schans. 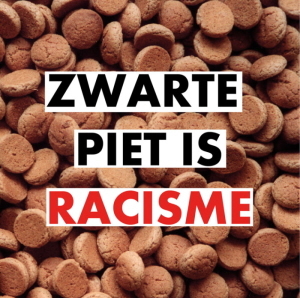 In 2016 the Dutch government cabinet issued a statement that it’s not for them to decide whether or not Zwarte Piet is racist, but that they are willing to facilitate discussion in Dutch society. The cabinet recognised however that the figure Zwarte Piet involved stereotyping and could unintentionally hurt peoples feelings. Although the government say that they are leaving it to the rest of society to decide, their praxis is to subsidise and facilitate the promotion of this racist caricature. The Dutch government does this by subsidising the NTR, who make television programmes for schoolchildren, and by providing the finances for local councils to provide free liability insurance to the people who volunteer to play blackface. In the Netherlands police also wear blackface as part of undercover operations during parades. Local government subsidise local welcome parades. This makes the racism state-subsidised. For years, the majority of Dutch society have avoided coming to a conclusion about racism, and have merely facilitated what they call a “discussion”. The discussion is regarded as a solution, in and of itself, to the problem of blackface. Opponents of this racism want the racism eliminated, instead of annually repeated. The interlocutory proceeding was interesting for a number of reasons. Firstly the plaintiffs, Majority Perspective foundation, summoned a wide variety of different defendants including the people who organised the welcome parade. Vinke Vision, the NTR television company who make the racist children’s programme, Nicam, a Dutch television content rating authority, and the Dutch Media Authority, who exist to supervise compliance to the Media Law of 2008, and the local Zaanstad council who not only will host the racist welcome parade, but also contributed extra money in order to hold it. The proceedings began with the plaintiffs explaining the effects of the visual imagery of the racist caricature of Zwarte Piet, and of the stereotyping, leading to perceptions of inferiority amongst people with a dark skin colour, especially people of African descent. The lawyer Emil Tamas then went on to explain that various human rights conventions had not only a vertical effect (that is, pertinent to the relationship between the government and the people), but also a horizontal effect, between citizens. Essentially this means that if human rights should be adhered to by everyone, then everybody has a responsibility towards the other. Tamas went on to explain how each party had fallen short of their responsibility. He questioned the concept of letting society decide what racism is, if I’m not mistaken, with the example of letting people who commit war crimes be judged by the very society which created those criminals. The defending parties, in turn, each defended themselves. The NTR complained that it was too short notice, the council said that they had hosted dialogues, the facilitators said that they had no influence on the players who would take part in the intocht, the ratings company said that they weren’t due to rate the programme at all, etc etc. After the break for lunch, Tamas, used his allocated time to expose two very real problems in the Netherlands, namely: not only is there insufficient legislation available to tackle the problem of discrimination, but institutions are organised in such a way that nobody has accountability. The very defences made in the first part of the proceedings proved that each party could easily argue “it wasn’t me”. But what was also very striking, Tamas pointed out, was that NONE of the defendants responded to the question of racism. Tamas likened the situation to the story where the emperor has no clothes on, but every body sees that he’s actually naked, but won’t admit it. The judge asked the NTR if they would be willing to analyse footage from the programme “het Sinterklaasjournaal” from the previous year, together with anti-racist activists, in view of modifying the following programmes. Paul Römer, the director of the NTR, refused! Ironically a moment when dialogue is NOT welcome. Römer said that he wanted to merely “reflect society”. Paul Römer’s father, Piet Römer, was a actor who played the blackface character of Zwarte Piet for years and is regarded by many as the “real” Zwarte Piet. Piet Römer died in 2012, and I am inclined to believe that Paul Römer has a personal mission to resist acknowledgement that Zwarte Piet is racism, in honour of his father. In any case, I sat next to Paul Römer in the first part of the hearing, and heard him react snidely whenever Tamas quoted English words. Tamas has a foreign accent, but is further eloquent in Dutch. The English pronunciation of Tamas is clear (I know as a Brit). The hint of foreign accent however was enough for Paul Römer to be mockingly dismissive. This reveals how matters of discrimination are not only a conscious priority for the NTR, but that matters of discrimination NEEDS to be! Many defendants relied on an arguably fundamentally flawed judgement by the Netherlands Institute on Human Rights. Tamas retorted that the Netherlands Institute of Human Rights was not neutral because they were financed by the government. The judge asked Tamas if also he, the judge, was not neutral because he too is paid by the government. Tamas asked the judge to make known by whom he had been appointed. The judge replied “the minister” and Emil responded “so?”. And there the matter was left. The Zaanstad local council warned that the whole welcome parade would be cancelled if they were forbidden to proceed as they had planned. Tamas, in turn, warned that he was prepared to take the matter to the European Court of Human Rights. Today, in approximately an hour, the court will issue their decision. Nobody, even the plaintiffs, expect that the Majority Perspective foundation will win, in the short term. But what this case has done, is reveal gaping deficiencies in the Dutch system, and a structural and societal indifference to victims of discrimination. The Dutch establishment prefers expediency to human rights or justice, to the extent that they have an actively aggressive policy towards antiracist activism, continuing to frame anti-discrimination activism as extremism. One of the people, Michael van Zeijl, in the Majority Perspective foundation placed a photo-shopped image of Sinterklaas sitting in the position of John Kennedy in the car prior to his assassination. He was arrested after the hearing for placing this photo online. The hypocrisy of the Dutch establishment is that they are selective about the context when, and who, they are willing to arrest.